Ireland Women's Hockey side at their homecoming following the World Cup. At just 20 years of age, and still a DCU student, Sarah Torrans is already a fully-fledged Ireland international. Last summer, Torrans was in the reserve squad for the 2018 Women’s Hockey World Cup, which saw the sport rise to prominence in the country as Ireland finished as runners up to the Netherlands. The aim is to make a genuine shift across the country, giving more to a nation of sport lovers as well as the gift of sport to more girls, according to the campaign’s official website. Torrans, who already had 14 caps to her name prior to the World Cup, has made it her aim ‘to inspire the next generation of young female athletes’. The Loreto Hockey Club player is now also coaching underage teams in both her club and her previous school. “I currently coach underage teams in my club Loreto Hockey Club, and where I previously went to school, Loreto College St. Stephens Green. “I really enjoy coaching these teams and get great enjoyment when I see them improving every week. “I always encourage them to go and watch senior games at the weekend where, hopefully, we can inspire them and show them what they can do in a few years’ time,” Torrans told The College View. Torrans mentioned the various roles available to women in sport and explained what she hopes to see before the end of the 20×20 campaign. “I would always advise girls and women to get involved with sport. Whether you are a player or a coach, women are capable of fulfilling any role. “Sport gives you great confidence and belief which is effective in everyday life,” Torrans said. “Of course the aim is to see more women involved in sport by 2020 but also to have much more coverage of women’s sport. “More coverage on the news, on TV and more advertising of upcoming events. This is important for the next generation to get out and support women and to aspire to get their name in the paper someday,” she explained. Hockey Ireland also made a pledge on March 8, as they launched their Green Army Ambassador programme and pledged to ‘visit more schools than ever before around the country inspiring the next generation’. 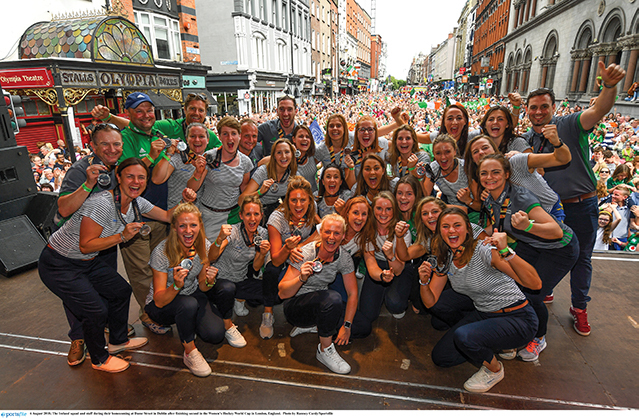 “Hockey Ireland are trying to get around to as many schools and clubs as they can and I’m sure this will continue throughout the summer as well,” Torrans said. Loreto currently sit second in the league, six points behind Pegasus, and are in the semi-final of the Irish Senior Cup. They played Railway Union in the semi-final of the cup on Sunday and won in a shoot-out to advance to the final to face Cork Harlequins. “The Irish Senior Cup semi-final is also coming up as well as the Champions Trophy, which we hope to be part of. “We also have the European Club Championships in Amsterdam in April, where we will play against the top teams in Europe which is very exciting,” Torrans said, speaking before the semi-final against Railway Union. In regards to the national side, Ireland will host the FIH Series Finals in Banbridge in June. Ireland are in Pool A with Malaysia, Czech Republic and Singapore while Pool B sees Korea, Scotland, Ukraine and France face each other. The top two sides from this competition will secure a place in the Qualification Events for Tokyo 2020. “This is a really important tournament for us in order to qualify for the Olympics. “We will then focus on the Europeans in August and, depending on our previous results in these tournaments, hope to get a good draw for the final Olympic Qualification in November,” Torrans explained. Image Credit: Ramsey Cardy / Sportsfile.